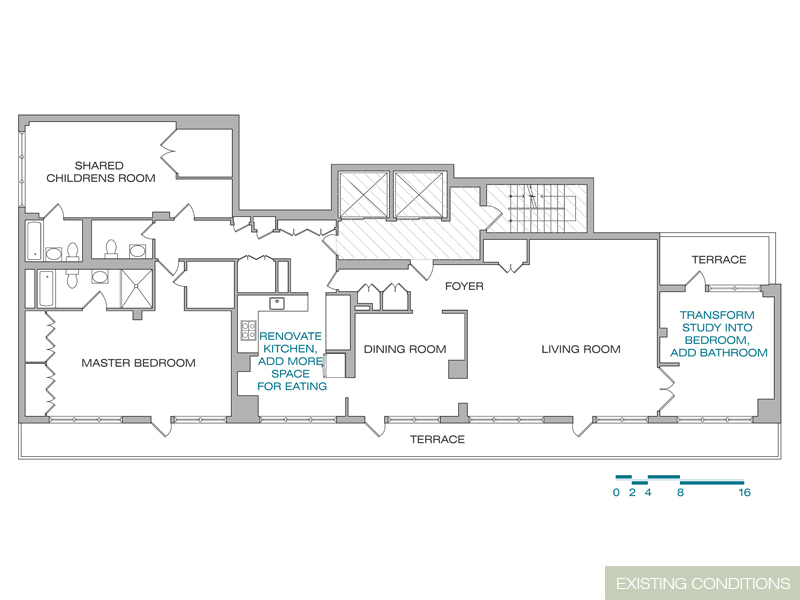 The owners of a two bedroom, two and a half bathroom apartment wanted to add a third bedroom with an additional full bathroom to give their oldest son his own room. They required the new bedroom and new full bath to be located at the far end of the apartment, in an alcove off of the living room. They also wanted to renovate their enclosed eat-in kitchen in which the area for their dining table was too small for the family. The location of the existing plumbing risers for the building would not allow locating the new bathroom at the north end of the apartment without a significant cost and cutting into the floor slab. Without being able to add a bathroom, having the bedroom separated across the apartment would not be ideal. Additionally, increasing the eating area in the kitchen would reduce the work/appliance space, further limiting functionality. LETA’s solution was a more significant renovation which aligned the public & private spaces in a proper manner and satisfied the client’s original goals. This required moving the kitchen into the existing dining room, opening it to the living area. 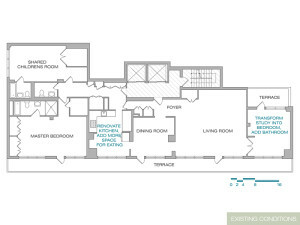 The former kitchen became the third bedroom, which located it next to the existing bedrooms and very close to an existing half bath that was converted into a full bathroom. A large pocket door was installed at alcove off of the living room, allowing it to serve as a guest room or to be separated when used as a home office. This design turned the public area of the apartment into an open loft-like space. Despite initial reservations by the client regarding having an open concept kitchen & living area, the client loves the new space which maximizes their square footage and works more efficiently than their original vision. 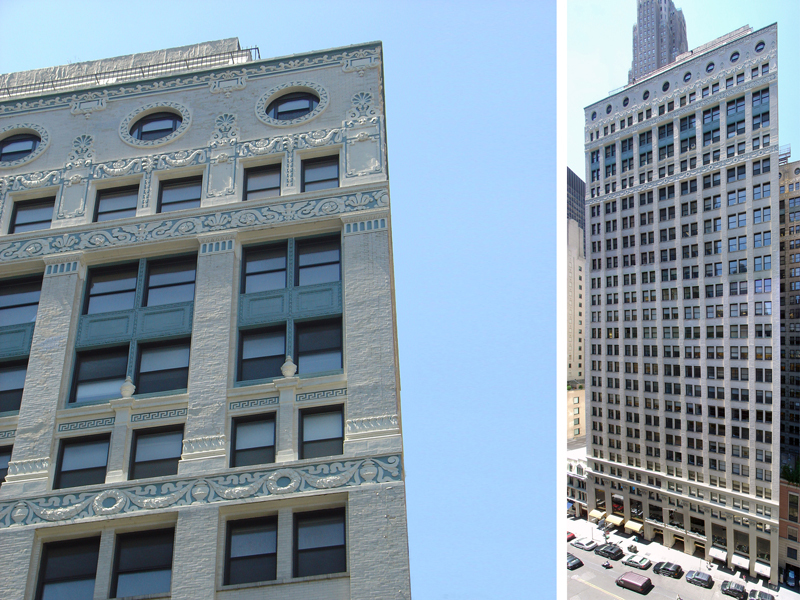 Located in a landmarked building a block south of Central Park with views of Columbus Circle, a strategic renovation was performed for a client looking to create a more inviting space for employees and guests. The client who leases out office suites to start-ups and individual professionals who need desk space, wished to maximize the number of offices in the new layout. The layout of the space consisted of an L-shape, running the perimeter along two sides of the building bounded by the core at the center. 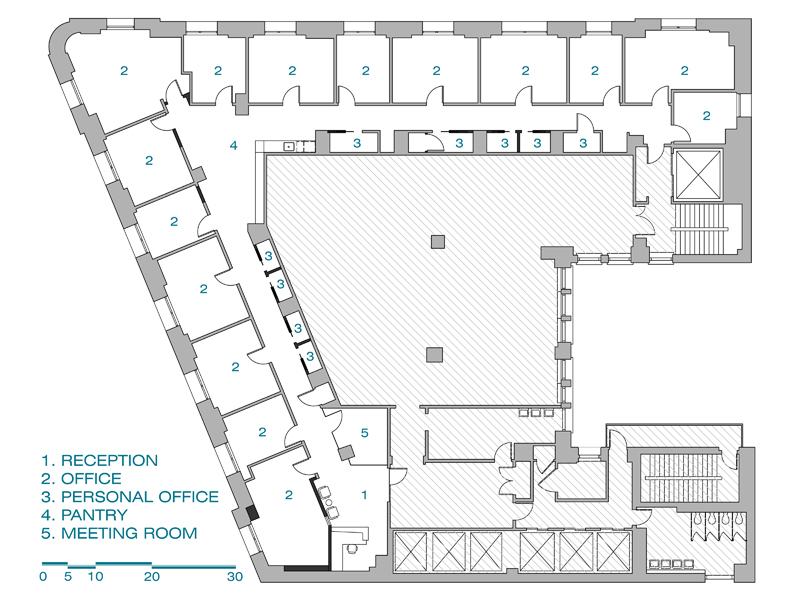 This limited layout options as enlarging or creating new office space would interrupt the circulation through the space. 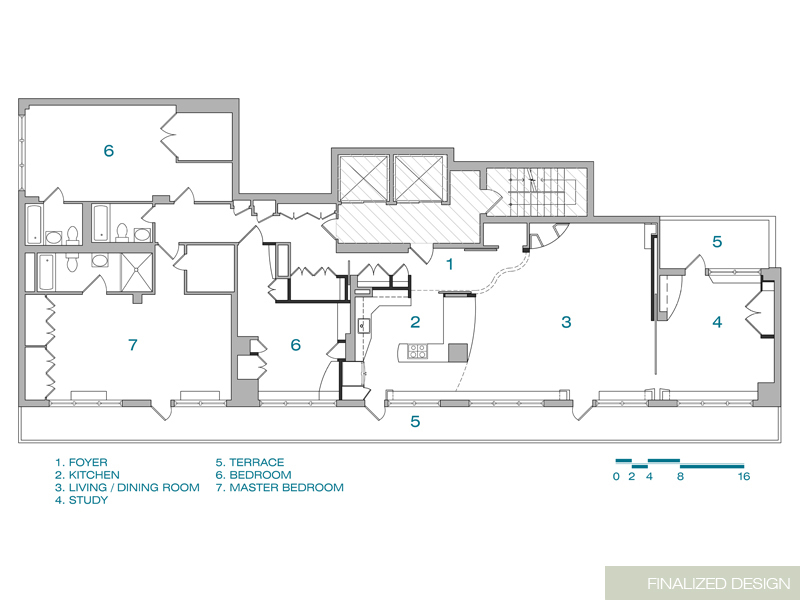 Additionally, space needed to be created for a shared pantry and eating deck in addition to a conference room and reception desk. LETA developed an axial design based on the floorplan shape. 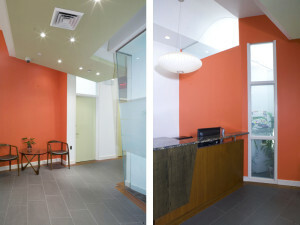 The existing office spaces were renovated with new finishes and furniture. Some of the office space was used to create the two common spaces, the employee pantry and the reception / conference area. As two nodes at the end of a hallway, they have a visual connection and were designed to communicate with each other. 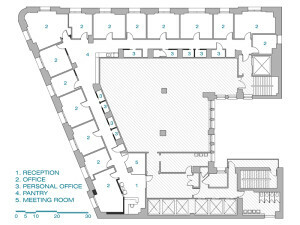 Office space lost was gained back by creating niche offices in-between column bays along the core walls. These spaces are leased out to mobile individuals who only need a few hours of desk space a day. The use of color and material creates focal points at the end of each axis and helps break up the long distance of each corridor. Warm wood was used in the custom designed reception desk and was continued as a border along the corridor floor to where it was picked up again in the cabinetry of the kitchen and the accent walls outside of individual offices. The combination of lighting, color, and wood helped make the office a more comfortable environment to all those who used its space. 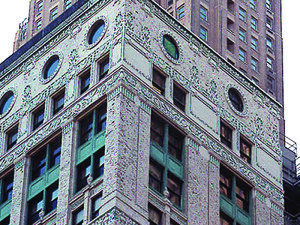 80 Maiden Lane is a 25 story, 500,000 square foot office building built in the early 1900’s, located in the Financial District. The ornate façade of the building had slowly deteriorated over time, as the glazed exterior brick began to crack, allowing water inside. 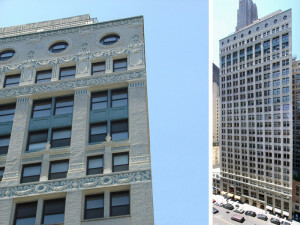 The buildings’ consulting engineer proposed a full removal and replacement of the façade with an estimate cost upward of 24 million dollars. This number was too high for the client and they searched to reduce the scope of work. LETA took over the project, and re-evaluated the scope and coordinated with Thornton Thomasetti Engineers to value engineer scope of remediation down to a strategic budget of 10-12 million dollars. Despite the lower budget number, the client requested a minimum scope of repair with the ability to do the full renovation at later date. A 3-4 million dollar budget was established for a repair to last the next 7-10 years to the next phase of work. LETA focused the minimal scope of work on areas immediate concern, repairing the parapet, patching the roof, and replacing strategic areas of the glazed exterior brick. LETA forecasted that this work would temporarily solve most of the issues, but not solve them. Approximately 10 years after LETA completed the minimal renovation, work was begun again to address the issues not resolved during the earlier phase of repair. The owners of a 4,500 sqft, three bedroom, three and a half bathroom house desired to create an addition to accommodate their growing family. They wanted each of their three children to have their own space. Additionally, the couple who are athletic and compete in marathons, their current space did not meet their training needs. The requirements for the two story addition included: a two car garage with access to a mudroom, a new home gym, and a laundry room with adequate work area and storage space. 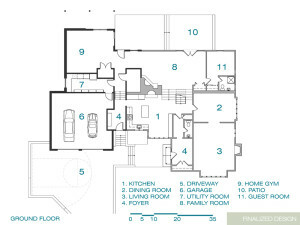 The second floor would include the new bedroom, as well as a new master bedroom with walk-in-closet and on-suite bathroom. The existing master bedroom was the right size and location to become the new child’s bedroom. The existing garage would be removed and a larger one built in its place that would be paired with the new gym, mud, and laundry room. 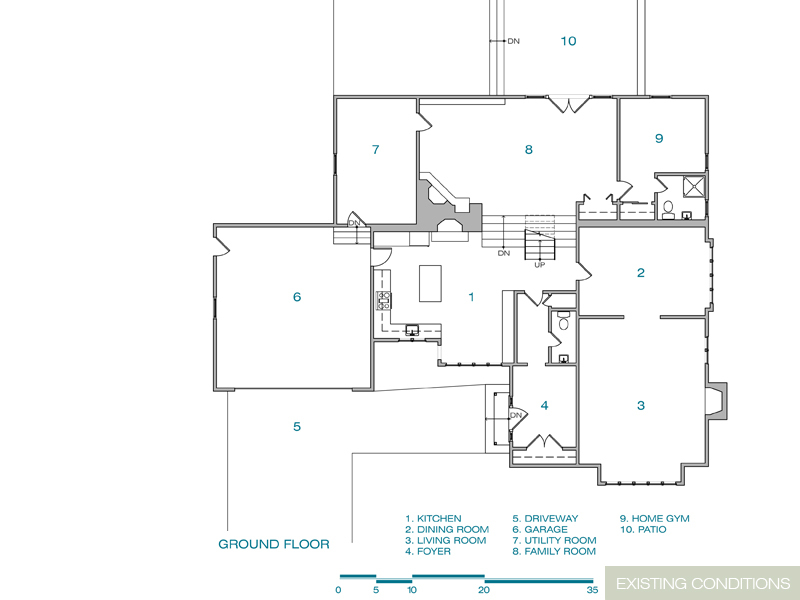 This new ground floor footprint would become the support for an ample master suite on top. 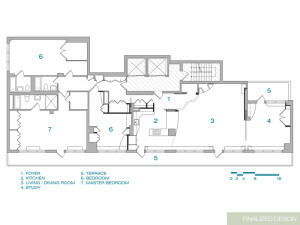 LETA proposed several schemes which were inspired by the use of the spaces to be in the addition. Since they were rooms that functioned independently from the existing home, schemes emphasizing the separation of the new addition were explored. The client enjoyed these conceptual studies but ultimately decided they wanted the addition to “look like it was always there”. LETA reworked the spatial organization to add in the spaces in a seamless manner. Priority was to maintain the existing second floor roof line and organize around that. 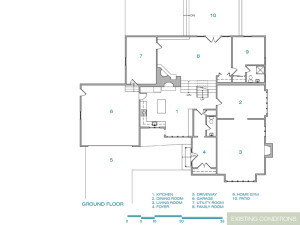 The ground floor included a new entry next to the larger garage, a utility room was located behind the garage and the home gym behind that, with access to the living room. The existing home gym was turned into a guest room. On the second floor, the existing master bedroom was turned into the third children’s bedroom. 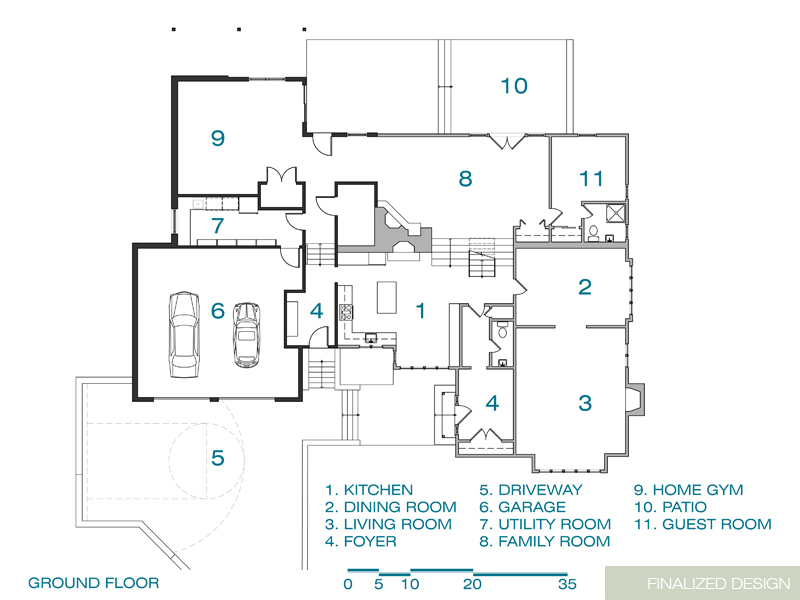 A master suite that included a walk-in closet and master bathroom was added, with a deck overlooking the rear yard. To complete the seamless addition, all siding, trim, fascia panels, and gutters were replaced.